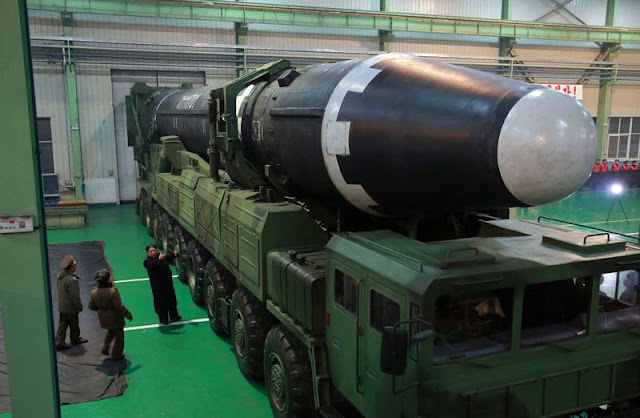 TOKYO (AP) — North Korea released dozens of photos Thursday of the Hwasong-15, a new intercontinental ballistic missile it claims can reach any target in the continental United States. The photo dump, published in the paper and online editions of the ruling party’s official daily, is a goldmine for rocket experts trying to parse reality from bluster. Their general conclusion is that it’s bigger, more advanced and comes with a domestically made mobile launcher that will make it harder than ever to pre-emptively destroy. But there’s a potentially major catch: it might not have the power to go much farther than the West Coast if it is loaded down with a real nuclear warhead, not a dummy like the one it carried in its test launch on Wednesday. North Korea boasted repeatedly in its announcement of the launch Wednesday that the Hawasong-15 was fired from a domestically made erector-launcher vehicle. Its photos back that up. Being able to make its own mobile launch vehicles, called TELs, frees the North from the need to get them from other countries, like China, which is crucial considering the tightening of international sanctions that Pyongyang faces. TELs make it easier to move missiles around and launch them from remote, hard-to-predict locations. That makes finding and destroying the Hawasong-15 before a launch more difficult. 0 Response to "What North Korean photos say about new ballistic missile"